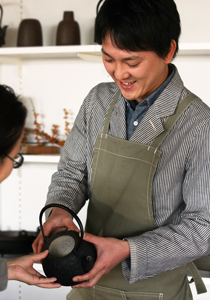 The Factory Shop adjacent to the OIGEN factory has a full range of OIGEN products, from traditional Nambu kettles and pans to the latest products designed to bring joy to the modern lifestyle. Find rare, limited products and great deals in the outlet corner. Enjoy perusing the vast selection of cast iron products at your leisure to find something perfect for you. Originally used as a company assembly hall, thoughtful renovation has created an open space through large windows that let in ambient light and harness the surrounding scenery. Most of the display fixtures are old work benches from the factory or furniture found abandoned in the store room, a break from the ordinary that helps portray the world-view of the OIGEN Nambu Tekki factory. Immerse yourself in the local tradition while enjoying the sights of this ancient iron casting town. 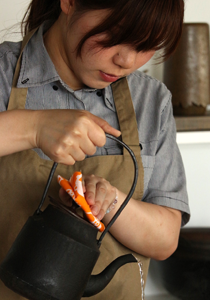 At OIGEN, our passion is to share the allure of traditional crafts and culture of Iwate Prefecture, offering a new and exciting image of this traditional craft that appeals especially to the younger generation both at home and abroad through the factory shop. 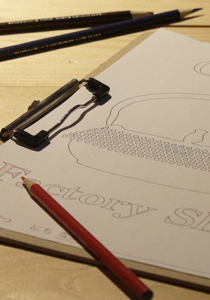 The factory shop not only features Nambu Tekki ironware, but also the local culture, history, craftspeople, and visitors. 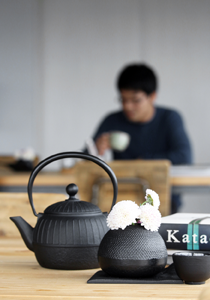 Experience the delights of water boiled in Nambu cast iron kettles first-hand with complimentary tasting of green tea and coffee. 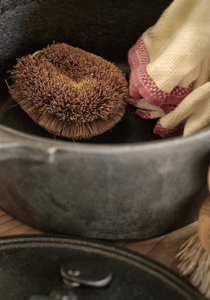 Staff are also on hand to help out with questions or queries such as dealing with rust or making the most of your cast iron utensils. Staff are also happy to advise you on local sights and cafés. The café area is stocked with magazines and children’s books so customers of all ages can relax and enjoy the space. Please ask the staff if your child would like to try one of our original color-in pictures. OIGEN Foundry is located in Hadacho, a town with a rich history of iron casting that lives on in the spirit of iron artisans. Enjoy walking through the rustic town after visiting the factory shop where each piece of ironware is individually crafted with care. The OIGEN Factory Shop is occasionally closed for company functions. Please call or check the NEWS tab of the website before visiting. 10 minutes walk from Mizusawa Esashi Station. Look for the concrete building with grey stairs & a yellow sign. You’ll find us on the second floor. Parking for 6 cars available across from the factory. © OIGEN. All Rights Reserved.